About terminal dentition and implants. Finding out you have terminal teeth can cause real concern. This is when your dentist has diagnosed your teeth as hopeless. Luckily, there are predictable and successful, even immediate solutions for terminal teeth. 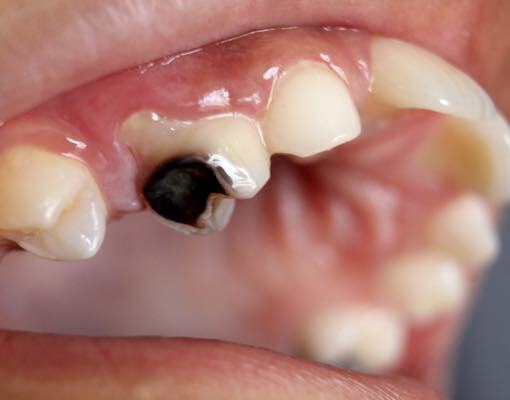 If your teeth can not be saved due to severe infections, abscesses, improper bite, decay or gum disease, then extraction is generally needed. Traditionally many dentists would wait for healing after extractions before considering replacement options. As missing teeth can cause additional inconvenience and stages of treatment, it is sensible to plan methods for replacement for those terminal teeth before they are removed. If you are confronted with terminal dentition, one of the options available thanks to modern dentistry techniques is the All-on-4 method: a full and immediate teeth replacement based on four implants. There are also other prosthetic and dental implant solutions that may be suitable for your situation. If you have terminal dentition, you may be experiencing several dental problems at the same time. People with terminal dentitions often have severe gum disease, and/or severe decay, and/or severe breakdown of their teeth, and/or root canal infections or abscesses, or other advanced dental problems. Often the end result of these problems is infective or inflammatory change in the surrounding gum and jaw bone, leading to damage or loss of the surrounding bone. This loss of bone can interfere with solutions available to you when you would require dental implants. Although by now the dental disease has already become severe, timely intervention can often preserve those last remaining areas of healthy jaw bone that would be useful for standard replacement solutions. Implant stabilised dentures (where dentures are held securely into position by implants but able to be removed for cleaning) can suit patients who are looking for simpler full mouth solutions, or cannot afford non-removable implant supported teeth, whilst still providing reliable aesthetics and function. Patients switching from standard dentures to implant-stabilised dentures, report major increase in comfort and stability. On the other hand, non-removable implant supported bridges are an option that take away the need for dentures altogether. We have performed hundreds of such cases successfully, immediately at the time of teeth removal, using our All On 4 Plus method – creating immediate transformative outcomes for suitable patients. After implant teeth are attached, it’s important for patients to stick to a soft diet for 2-3 months to help ensure a successful outcome with implant integration. At All On 4 Clinic Perth we offer a variety of procedures applying the All On 4 and All on 4 Plus® methods. At All On 4 Clinic Perth we also have a particular expertise using IV Sedation Dentistry. For you as a patient, this means you can enjoy a comfortable and relaxing “sleep” and wake up to a new confident smile and improved oral health. All On 4 Clinic Perth: Who are we? At All On 4 Clinic Perth, we are a team of highly qualified professionals led by Perth dentist Dr Misagh Habibi. His clinic Complete Implant & Sedation Dentistry was chosen as the Perth Associate for Australia’s All On 4 Clinic, started in Melbourne by Dr Alex Fibishenko who pioneered All-on-4 in Australia. Dr Habibi has a particular interest and expertise in implantology, implant related oral surgery, and the use of full teeth replacement methods such as All On 4 and his strengthening variation to the well known technique, All on 4 Plus Ti. This solution means that the immediate All-on-4 teeth have a permanent milled titanium framework incorporated for optimal strength and longevity. If you have been diagnosed with terminal teeth, contact our clinic in Subiaco to book your appointment and find out about you solutions.